The loss of a spouse is truly heartbreaking. And tragically, it can come with a major financial burden, too. Carolyn knows firsthand. While visiting the food pantry at First United Methodist Church in Bristol, PA, Carolyn shared that her husband, Mike, had passed away three years ago. Mike had pancreatic cancer, and Carolyn was caregiver to him and their two children, who are now grown. Soon after her husband’s passing, she began struggling with her budget. Carolyn cleaned houses and did odd jobs to supplement her income, but often, she says a trip to the grocery store just wasn’t in the budget. That’s why Carolyn’s so glad a friend of hers told her about the food pantry. Although she says she felt embarrassed to reach out for help, she’s so glad she did. “If I didn’t come here, I wouldn’t be able to eat much other than ramen noodles,” Carolyn says. Visiting the pantry has improved Carolyn’s nutrition. She’s now able to try new, healthy foods — like edamame and spinach pasta. Your gifts to Philabundance mean she can fill her kitchen with nutritious foods like these. 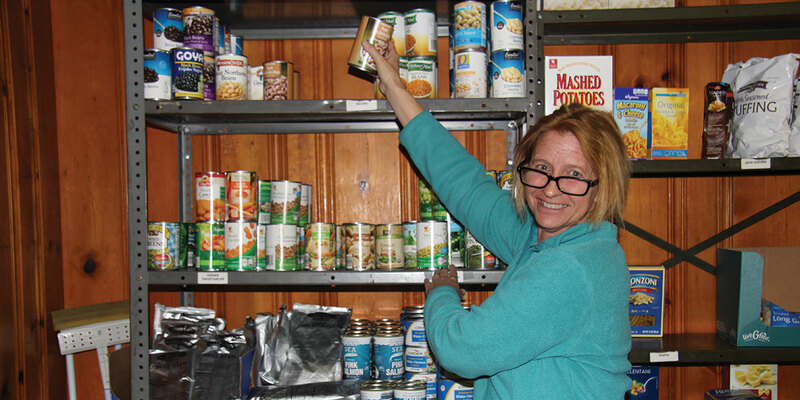 Beyond providing her with quality groceries, Carolyn says the pantry makes her feel welcome. She appreciates the volunteers for their kindness and for not making her feel ashamed for visiting. With all she’s been through over the past few years, it’s a comfort to know she can depend on caring neighbors — like you — for a hand up. There are so many people like Carolyn who just need a little help to get by. Your support is a lifeline. Thank you!